Development Synergy: 2015 International Women's Day: Happy International Women's Day from Development Synergy! 2015 International Women's Day: Happy International Women's Day from Development Synergy! 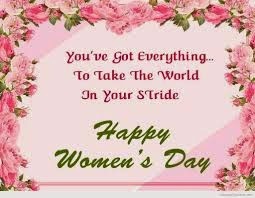 International Women's Day: We will like to use this opportunity to wish every woman out there a Happy International Women's Day! We at #DevelopmentSynergy join the rest of the world today 8th March to celebrate you. The world recognizes your contributions and impact inspite of every challenge. We celebrate you now and always!